The Cuisinart 622-30G classic 12" open skillet is ideal to saute mushrooms or brown sausages to perfection. It features hard anodized construction which uses less energy to cook the food. The Quantanium nonstick interior is reinforced with titanium and provides lasting food release, healthily nonfat cooking option and easy clean up. The solid stainless steel riveted stick handles stays cool on the stovetop, while its lid seals in moisture and nutrients for healthier, more flavorful results. The 12 Skillet W/Glass Cover Non-Stick Hard Anodized has many exciting features for users of all types. See the 12 Skillet W/Glass Cover Non-Stick Hard Anodized gallery images above for more product views. 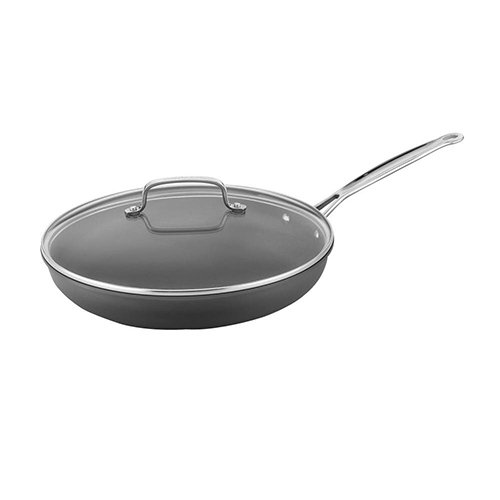 The 12 Skillet W/Glass Cover Non-Stick Hard Anodized is sold as a Brand New Unopened Item.